Theft is estimated to cost the construction industry over £3 million every week. Datatag ID Limited, the power behind the world’s most successful equipment security and registration scheme-CESAR, is tackling the issue of increased thefts in construction with the launch, at the Infrastructure Show (NEC Birmingham October 17-19), of a comprehensive new solution called ‘total site protection’. Incorporating an array of high technology security marking devices including Radio-frequency identification (RFID) transponders, forensic liquid DNA, microscopic Datadots®, and, UV stealth etching technology the new Datatag ‘total site protection’ system can protect just about anything that thieves are likely to steal. 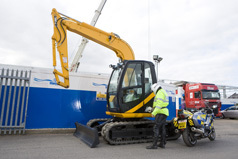 This includes mini-excavators, telescopic handlers, backhoes, dipper and loader end attachments, all terrain vehicles, hand operated power tools, computers, surveying equipment, 4 x 4 and LCV vehicles, and trailers. Construction equipment theft is a huge problem and theft, by organised gangs, opportunistic thieves, and even employees, is on the increase. A survey, conducted by the Chartered Institute of Building in the UK, shows that over 63% of respondents have experienced theft from construction sites on a monthly basis. The survey identified that tools, small plant, and heavy plant are all at risk with the vast majority of respondents having first-hand experience of theft. The survey showed that tools (82.8%) and small plant (68.6%) are most at risk but that even heavy plant theft is common (28.8%). The Datatag security marking system gives each piece of equipment a unique ‘fingerprint’ that thieves simply cannot remove. The ‘total site protection’ system acts as a powerful deterrent against theft and an invaluable aid in recovery. Datatag and CESAR are well known to criminals who regard marked equipment as ‘too hot to handle’. All the above can be installed by a Datatag trained and CRB vetted technician. The Datatag ‘total site protection’ system is convenient to install with a minimum of fuss. Datatag has a network of fully trained and CRB checked installers across the UK who can quickly protect a construction site’s valuable and critical equipment. Proof of ownership and the original registration documents are required for machines and vehicles protected under the CESAR scheme. CESAR, the only official UK equipment security and registration scheme, became the most successful and widely used scheme in the world at the turn of the year after achieving 15,000 registrations in 2010 taking the cumulative figure to 40,000. Now, just 10 months later, CESAR has achieved another 25,000 registrations, bringing the total number of machine registrations to 65,000! With crime on the increase, the deterrent effect of the Datatag ‘total site protection’ system is a sensible precaution to protect employees from the threat of theft and a sound business decision to minimise the risk of theft and the cost of the disruption caused by loosing an essential piece of equipment.